Rev. J. G. Wood : Tonga, Tahiti, and Hawai'i, 1870. American Publishing Company, Hartford, Connecticut, 1870.
: G. Routledge and Sons, London. 1868. J. B. Burr & Co., Hartford, Conneticut, 1883. Wood's account of the Pacific islands, as probably the vast majority of this work, is compliled from previously published works. There is a brief mention of surf-swimming in Tonga based on George Vason's Narrative, published in 1810, and a detailed account of canoe surfing in Tahiti, attributed to James Cook. This is actually William Anderson's report at Matavi Bay in 1777, as published in the official account of Cook's third voyage, edited by John Douglas. The report of Hawaii also quotes from official account of Cook's third voyage, supplemented with later material, probably from William Ellis' Polynesian Researches, 1830. Note that the Tahitian account is sub-titled Surf Riding, whereas the sub-title for the Hawai'ian text, and the illustratation, is Surf Swimming. Wood's cultural bias is exemplified by describing the Hawai'ian gourd headwear, illustrated in Masked Warriors on page 1089 (1883) showing the crew of an double war canoe, as "a most ludicrous fashion." - page 1095 (1883). The illustration Surf Swimming by Sandwich Island Natives is probably one of the best and most accurate from the pre-photographic era. A highly detailed image, it denotes various riding positions, stance, duck-diving, waves in sets, off-shore winds and significant wave height. "With over 700 fine illustrations from new designs, by Zwecker, Anoas, Danby, Wolf, Handley, etc. etc"
The engravings are accredited to The Brothers Dalziel. "The Brothers Dalziel were a highly productive firm of Victorian engravers founded in 1839 and until the advent of photo-mechanical processes, circa 1880, they were pre-eminent in their trade. Examples of their work can be seen in the Victoria and Albert Museum in London." 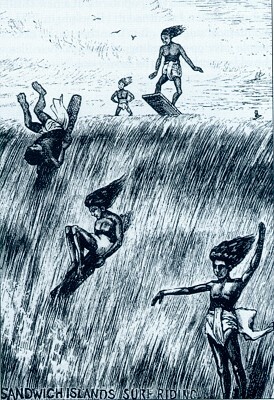 In 1883, a similar, but rather crude, illustration titled Sandwich Islanders Surf Riding, appeared in The Boy's Own Paper, published by the Religious Tract Society, London, and know to have included articles by Rev. John Wood. For the illustration, see below. The style and composition of the illustration bares a remarkable similarity to the work of Wallis Mackay, published in by Summer Cruising in the South Seas by Charles Warren Stoddard, published in 1874. 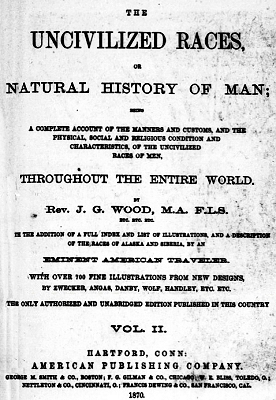 The first edition, titled Natural history of Man, was published in two volumes by G. Routledge and Sons, London in 1868. 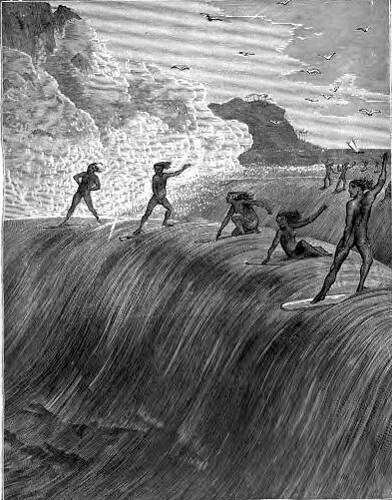 "Profusely illustrated with engravings by the brothers Dalziel," the illustration Surf Swimming appears in Volume II along with the Hawai'ian surf riding text on pages 168-169. - DeLaVega: Surf Literature (2004) page17. The book was printed in multiple editions for the next fifteen years. it was printed in America and England by various publishers, with some modification of the title and variations in the formating and pagination. The 1870 editon has the Hawai'ian text and the illustration on pages 437-439. The Hawai'ian text appears on page 1092 of the 1883 edition, with the illustration following on page 1093. As the 187onilne edition has been transcribed from microfilm, the online version of the 1883 edition is far more legible. G. Routledge and Sons, London, 1868. American Publishing Co., Hartford, Conneticut, 1870. J. B. Burr and Company, Hartford, 1870. J. B. Burr, Hartford, Conneticut, 1871. J.B. Burr and Hyde Publishers, Hartford, Conneticut (1870), 1872. J. Brainard & Company, New York, 1873. J. B. Burr Publishing Co., 1876. J. B. Burr Publishing Co, 1877. J. B. Burr and Company, Hartford, Conneticut,1878. J.A. Brainerd & Co., Cincinnati, Ohio, 1878. J.A. Brainerd & Company, San Francisco, 1883. "English writer and lecturer on natural history, was born in London on the 21st of July 1827. He was educated at Ashbourne grammar school and at Merton College, Oxford; and after he had taken his degree in 1848 he worked for two years in the anatomical museum at Christ Church under Sir Henry Acland. In 1852 he was ordained a deacon of the Church of England, became curate of the parish of St Thomas the Martyr, Oxford, and also took up the post of chaplain to the Boatmen's Floating Chapel at Oxford. He was ordained priest in 1854, and in that year gave up his curacy to devote himself for a time to literary work. In 1858 he accepted a readership at Christ Church, Newgate Street, and he was assistant-chaplain to St Bartholomew's Hospital, London, from 1856 until 1862. Between 1868 and 1876 he held the office of precentor to the Canterbury Diocesan Choral Union. After 1876 he devoted himself to the production of books and to delivering in all parts of the country lectures on zoology, which he illustrated by drawing on a black-board or on large sheets of white-paper with colored crayons. These "sketch lectures," as he called them, were very popular, and made his name widely known both in Great Britain and in the United States. In 1883-1884 he delivered the Lowell lectures at Boston." - "MRS HENRY WOOD." LoveToKnow 1911 Online Encyclopedia. © 2003, 2004 LoveToKnow. "As well as being editor of 'The Boys Own Magazine', Wood's numerous publications include 'Bees', 'The boy's own book of natural history', 'Animal traits and characteristics', 'The natural history of man', 'Half hours with a naturalist', 'Common British beetles', 'Illustrated natural history for young people', 'Natural history', his most important work. He was most renowned for the series of books which began with 'Common Objects of the Seashore', many of which are held in the Whipple Library. This article incorporates public domain text from: Cousin, John William (1910). A Short Biographical Dictionary of English Literature. London, J.M. Dent & sons; New York, E.P. Dutton." WlTH OVER 700 FINE ILLUSTRATIONS FROM NEW DESIGNS, BY ZWECKER, ANOAS, DANBY, WOLF, HANDLEY, ETC. ETC. ENGRAVED BY THE BROTHERS DALZIEL. Being islanders, they are very familiar with the water, and practise the well-known sport of surf-swimming. This sport will be described when we come to treat of the Sandwich Islands. They have another aquatic sport peculiar to themselves. Two posts are driven into the bed of the sea, about seventy yards apart, a spot being chosen where the water is about ten feet deep. Each player takes in his hands a large stone, jumps into the water by one post, and tries to carry it to the other post by running along the bottom. The chief difficulty is to pursue a straight course, as at such a distance the winning post is not visible through the water. "Neither were they strangers to the soothing effects produced by particular sorts of motion, which in some cases seem to allay any perturbation of mind with as much success as music. Of this I met with a remarkable instance. For on walking one day about Matavai Point, where our tents were erected, I saw a man paddling in a small canoe so swiftly, and looking about with such eagerness on each side, as to command all my attention. At first I imagined that he had stolen something from one of the ships, and was persued; but on waiting patiently saw him repeat his amusement. He went out from the shore unti he was near the place where the swell begins to take its rise; and watching its first motion very attentively, paddled before it with great quickness till he found that it overtook him, and had acquired sufficient force to carry his canoe before it without passing underneath. He then sat motionless, and was carried along at the same swift rate as the wave, till it landed him upon the beach, when he started out, emptied his canoe, and went in search of another swell. I could not help concluding that this man felt the most supreme pleasure while he is driven on so fast and so smoothly by the sea, especially as, though the tents and ships were so near, he did not seem in the least to envy, or even to take any notice of the crowds of his countrymen collected to view them as objects which were rare and curious. During my stay, two or three of the natives came up, who seemed to share his felicity, and always called out when there was an appearance of a favourable swell, as he sometimes missed it by his back being turned and looking about for it. Page 437 THE SANDWICH ISLANDS. We now come to the various games with which the Sandwich Islanders amuse themselves. Chief among them is the sport of surf-swimming. One particular mode in which they sometimes amused themselves with this exercise in Karakakooa Bay, appeared to us most perilous and extraordinary, and well deserving a distinct relation.
" The surf, which breaks on the coast round the bay, extends to the distance of about one hundred and fifty yards from the shore, within which space the surges of the sea, accumulating from the shallowness of the water, are dashed against the beach with prodious violence. "Twenty or thirty of the natives, taking each a long narrow board, rounded at the ends, set out together from the shore. The first wave they meet they plunge under, and, suffering it to roll over them, rise again beyond it, and make the best of their way by swimming out into the sea. The second wave is encountered in the same manner with the first; the great difficulty consisting in seizing the proper moment of diving under it, which, if missed, the person is caught by the surf, and driven back again with great violence; and all his dexterity is then required to prevent himself from being dashed against the rocks. As soon as they have gained, by these repeated efforts, the smooth water beyond the surf, they lay themselves at length on their board, and prepare for their return. As the surf consists of a number of waves, of which every third is remarked to be always much larger than the others, and to flow higher on the shore, the rest breaking in the intermediate space, their first object is to place themselves on the summit of the largest surge, by which they are driven along with amazing rapidity towards the shore. "If by mistake they should place themselves on one of the smaller waves, which breaks up before they reach the land, or should not be able to keep their plank in a proper direction on the top of the swell, they are left exposed to the fury of the next, and, to avoid it, are obliged again to dive and rrgain the place from which they set out. "Those who succeed in their object of reaching the shore have still the greatest danger to encounter. The coast being guarded by a chain of rocks, with here and there a small opening between them, they are obliged to steer their board through one of these, or, in case of failure, to quit it before they reach the rocks, and, plunging under the wave, make the best of their way back again. SURF SWIMMING BY SANDWICH ISLAND NATIVES. ... attended with the loss of the board, which I have often seen, with great terror, dashed to pieces at the very moment the islander quitted it. The boldness arid address with which we saw them perform these difficult and dangerous mantvuvres was altogether astonishing, and is scarcely to be credited." ... motion of their return as long as possible. Both sexes and all ranks unite in it, and even the very chiefs themselves, who have attained to the corpulency which they so much enjoy, join in the game of surf-swimming with the meanest of their subjects. Some of the performers attain to a wonderful degree of skill, and, not content with lying on the board, kneel, and even stand on it as they are hurled shorewards by the giant waves. The boards are of various sizes, according to the age and stature of the owner. For adults they are about six feet in length. They are slightly convex on both sides, and are kept smooth - all surf-swimmers cherishing a pride in the condition of their boards, and take care to keep them well polished and continually rubbed with cocoa-nut oil. Such utter mastery of the waves can only be obtained by familiarity with the water from earliest childhood. A Sandwich Island child can swim as soon as it can walk, if not sooner, the mothers taking them from tlie breast, laying them on the surface of the water and encournging them to kick about as if lying on their mats ashore. One writer mentions his encounter with an object which he took to be a very large frog, but which turned out to be a Kanaka (i.e. Sandwich Island) baby, which was lying on its back and disporting itself quite at its ease. Indeed, in the mind of a Sandwich Islander there seems to be no connexion between the ideas of water and danger, neither does it enter his imagination that any human being is unable to swim. Consequently, there have been several instances where white men have fallen into the water and have been almost drowned, though in the presence of the natives, simply because the idea that any one could be endangered by falling into the water never occurred to them. Religious Tract Society, London , 1883. October 1892 - October 1893. The Boy's Own Paper, London. Surfing in Hawaii (2011) page 20.
and of their physical, social, mental, moral and religious characteristics. Geoff Cater (2012-2013) : John Wood : Uncivilized Races, 1870.